The sunglass complies with the regulations and the essential safety requirements established by directive 89/686/according to the reference standard EN ISO 12312-1:2013. This is a personal protective equipment (PPE) rated class 1, developed to protect the user from the armful effects of sunrays and to offer UV protection according to the main International Standards. Only use original spare parts and follow the instructions given by the manufacturer. Replace lenses and other components in the event of wear. This product is not suitable for direct viewing of sun and for exposure to UV radiation produced by artificial sources. It is not suitable for driving under conditions of poor light. See usage and filter categories. To clean your sunglasses, use water and soap avoiding all types of solvents or alcohol. Do not use dirty or abrasive cloths which could alter the features of their filters. With the help of this informative report, it is possible to find the specific instructions concerning your sunglasses. 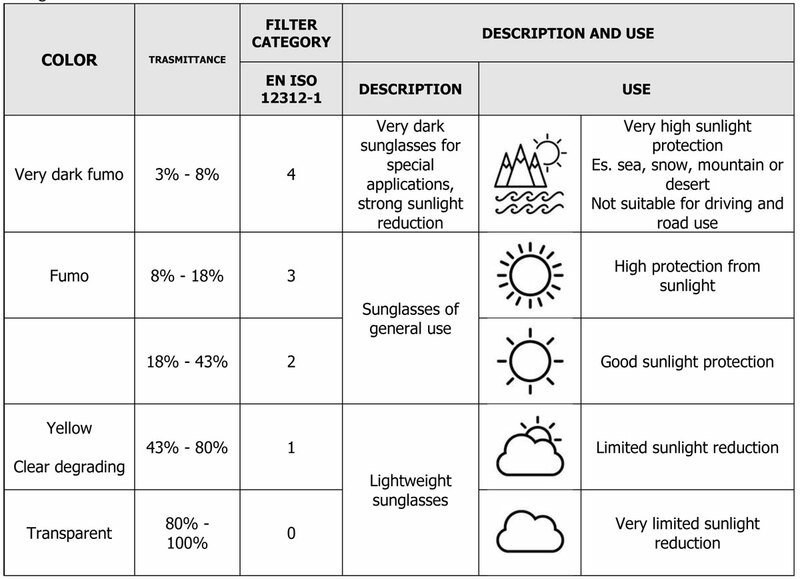 Note: Photochromic lenses go from a category 0 filter in low light to a superior category filter in conditions of greater lighting. Mask for all types of motorcycles and mopeds, excluding official races and competitions. The Baruffaldi mask was found to conform to the essential health and fitness requirements applicable in the Council Directive 89/686/EEC and comply with the harmonized standard EN 1938:2010. This mask is suitable for driving on the road. Filter Category F.C. When wearing the mask, adjust the length of the elastic band to fit the device perfectly to the face. Store the device in its original container (microfiber bag) when not in use at a temperature between 5 and 30° C in an environment free from organic vapors. It is necessary to check that the surface of the eyepiece does not have grooves, cuts or other dents that may obstruct the correct visibility. To clean the eyeglass, use water and soap, avoiding the use of solvents and alcohol. Do not use dirty or abrasive cloths that may alter filter characteristics. Replace the eyepieces when they present scratches or surface damage caused by deterioration due to normal use. Use only original spare parts supplied by Baruffaldi Goggles Srl.